Scones have a history with our family, almost an overabundance. So, for us the thing about scones is that you have to be in the mood for them. It's not like "mmm donut" (al la Homer Simpson). It's more like "mmm tea time, lets have a scone." With it being the first week of Spring, we decided that tea parties and scones are in season. We have a book on scones and it looked like the most delicious recipe was for Blueberry Crumbcake Scones. Here's how it went: We measured out all the ingredients, because honestly it makes the process soooo much faster and easier. We mixed the wet ingredients (eggs, vanilla, lemon zest, and milk) and the dry ingredients(flour, baking powder, and salt) separately and then put them together. Then in went the fresh blueberries. YUM! You shape the dough into a 9" pizza in the center of the baking sheet. Next the topping of crumbly butter, cinnamon, and flour. Here is the new part that we didn't know about: you cut the Scone into 8 pieces before you bake it. It bakes for about 35 mins or until it is golden brown and a tester comes out clean. Then you can enjoy it with some tea. These things are delicious when served warm. Lessons learned: Not all Scones are created equal. Fresh blueberries in baking is something we are going to have to try again. We are glad we now know how GOOD scones are made so we will be having them on Easter, per Mom's request. Cran-Orange perhaps? Well, it's St. Patrick's Day. Guinness Brownies it is. 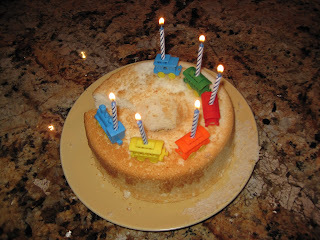 Sure beats yellow cake with green food coloring. We searched for the recipes online and found lots that had white chocolate chips in them. For some reason, we thought that that was wrong. We found this recipe at a great food blog Bitchincamero, that's Camero with and "E" not like the car. We're fan's. We like this recipe cause it's a whole bottle of guinness minus a gulp, we used ghirardelli, and it's really good. The brownie came out a bit rich but with a scoop of vanilla ice cream it is pretty perfect. It is simple with the ingredients. Whole wheat pastry flour, pure cane washed sugar, and lots and lots of chocolate. Bittersweet Chocolate 60% dark, Milk Chocolate, Semi Sweet Chocolate and Cocoa Powder. It is the first time that we used whole wheat pastry flour and we are still not sure of the difference. I guess we will have to make something that we have made before and see how it tastes. This week, we also had to make friends with eggs especially after last week. It went well! The chocolate was melted, the rest of the ingredients combined and into the oven it went. The came out, they taste good but we have to admit that they taste more like Ghirardelli than Guinness. That's alright by us though. Our Mom is from San Francisco where Ghirardelli is king. It seems fitting. We dusted them with powdered sugar and found it necessary to serve with vanilla ice cream. It's a great treat. So, Happy San Fran St. Patty's Day everyone. Enjoy! Lessons learned:Maybe next year we make Guinness Bread instead to get more of a malty yummy flavor. Eggs can be friends, when Sara cracks them. Maybe darker chocolate is better? or maybe we need to drink some green beer. Meatloaf is a touchy subject sometimes. At a restaurant, you'll try it but swear your Mom's is better. At a friend's house, you'll smile and eat it, be polite and not mention that your Mom's is better. For us, our Mom's recipe really is better. Honest! We've been sworn to secrecy a couple times by friends that admit that they like our Mom's meatloaf better than theirs. The secret must be simplicity. We can't say that it is a healthy dish but, it is delish! There are no vegetables in there. There are only a few ingredients, but they serve to make up one of our family's favorite dishes. We asked our Mom to give us some details about this dish but there doesn't seem to be much to tell. Ladies and gentlemen, it's easy and it's yum. That's all you need to know. The items pictured plus ground beef, milk and an egg/lb of it is all you need. This is something our Mom has been making for us throughout our lives. It's our Dad's favorite dish and making it is almost like breathing to her. She barely paused for us to get pics and understand each step to relay it to you. These all get mixed together by hand. Nothing was actually measured here when Mom did it. The actual amount we were told for the milk is "Until it's smushy" so as you add it a bit at a time as you mix it all up. The milk gets absorbed by the bread crumbs so I believe she is referring to the overall texture. We never had any crumbly texture in the meatlaof she made so make sure it's moist but definitely not anywhere close to soupy. 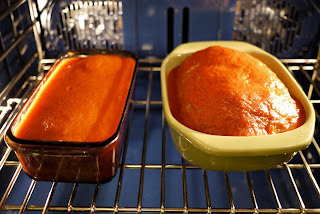 The mixture then gets shaped into a loaf (go figure), placed in a baking dish and then covered with tomato sauce. We made a 2lb meatloaf for dinner and a 1 pounder for lunch the next day (can you tell we like this stuff?). Both had a whole can of tomato sauce poured over it. Everything else was halved for the smaller one. The bigger one was placed in the oven as we were preparing the smaller one as it would need more time to cook. It takes an hour at 350 degrees for the 1 pounder to get cooked, 1/2 hour more for the double. That's it! So, Mom may not have much to say about her meatloaf but we do. Your Mom may use onions or half ground beef, half ground pork, or even wrap it in bacon. Those are probably lots more flavorful but trust us, this recipe holds its own. 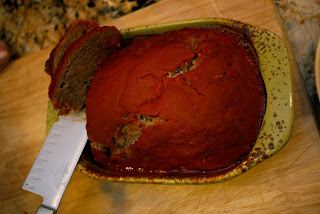 In addition to being one of our family's favorites, as crazy as it sounds, this meatloaf has helped shape our family. This recipe is one of only a handful that we were brought up with. Our Mom doesn't consider herself much of a cook but we sat down and had dinner as a family (we still do it almost every week at least once). This was important to us because it was an major part of our support system. Our Mom may not have taught us how to cook but she taught us that we could do anything we put our minds to. Sara never really baked before this year and I always made the same few things over and over but we knew that we could try new things have fun. 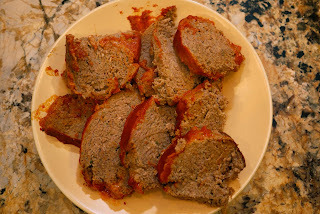 Our Mom and Dad (and this meatloaf kinda) are a major part of why you get to read this blog. So, go make some yummy meatloaf and go call your Mom. 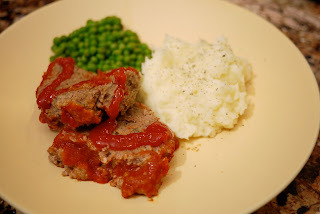 Lessons learned: How to make Mom's meatloaf. We didn't know it before but we're glad we know now.